"There is nae God but Allah an Muhammad is the messenger o Allah"
Green flags bearing this or ither Arabic scripts ar frequently seen in Islam an shoud no be ramsfeelt wi the Saudi naitional banner. These ither flags normally dae no bear the swuird seembol. The banner is manufactured wi identical obverse an reverse sides, tae ensure the shahada reads correctly, frae richt tae left, frae either side. The swuird pynts tae the left on baith sides, in the direction o the script. The banner is sinister hoisted, meanin that it is hoistit tae the left o the flagpole, as viewed frae the obverse (front) side. (Flagpole is tae the richt o the banner). 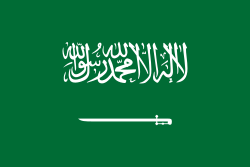 Wikimedia Commons haes media relatit tae Flags of Saudi Arabia.